I’m not at my best in the morning. Actually, I’m not at my best until at least 2pm. (Although actually, some might argue it’s even a little later.) 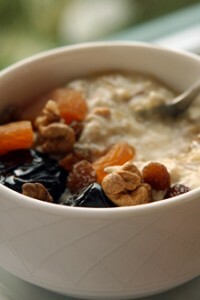 To me, breakfast is meant to be enjoyed in monk-like solitude. It’s a time where questions are prohibited and talking should be kept to an absolute minimum. Travel, of course, is fraught with all sorts of ways designed to thwart my precious few moments of quietude in the morning. There’s waking up in hotel rooms and stumbling toward the breakfast room, where unfamiliar people await, sometimes wanting to actually engage with you. What’s up with that? 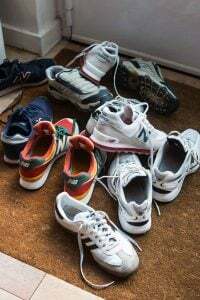 And for those of us who are creatures of habit with their morning rituals, it can be a challenge to muster up the energy to adapt to unusual rituals and unfamiliar foods. 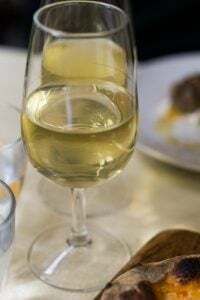 In France, breakfast is always a simple affair; just a bowl of café au lait, some toast with butter – and perhaps a bit of jam or honey – and a small glass of orange juice. And that’s it until lunch. And I’m fine with that. Well – until I go back to America. But en route, there are hotel breakfasts and buffets, overloaded with pancakes, waffles, bacon, scrambled eggs and six-egg omelets overflowing with cheese, heaping bowls of oatmeal with butter and brown sugar, a fruit salad (fresh, if you’re lucky), and not-exceptional coffee by the pitcherful. In San Francisco, my adopted Chinese family takes me out for dim sum, and I can’t resist every single plate of dumplings that pass by on the cart, barely able to keep an eye on the ones I’m eating while the next stainless-steel cart with steam wafting off the top approaches. Of course, I indulge in it all. And, of course, I come home carrying a bit of extra baggage. And not the kind of excess baggage that you simply pay a simple fee for and it’s quickly dispatched away, unfortunately. Being a creature of habit, when home I like my simple French breakfast. 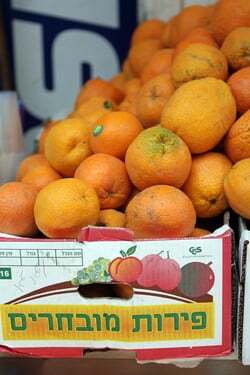 But traveling in hot climates, like in Israel, I found myself not wanting hot things, and craving fresh foods. 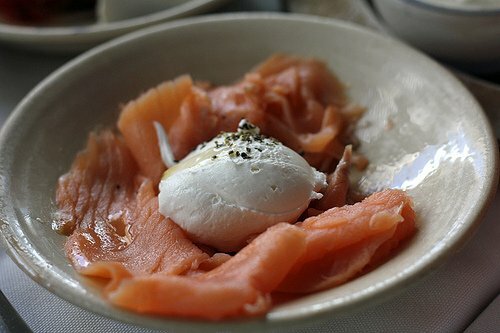 And in Israel, the Israeli breakfast may consist of – but is certainly not limited to – various kinds of yogurt, labane (yogurt cheese), white cheese, just-pressed juices in a variety of colors and flavors, cottage cheese, salads made with any combination of tomatoes, cucumbers, herbs, and olive oil, small omelets, salty olives, roasted peppers, flat breads, and marinated fish. Although there are lots of salads and cheeses for breakfast, I do like les œufs, and whenever I see Shakshuka on the menu, a baked egg dish, I like to try the version wherever I’m at. 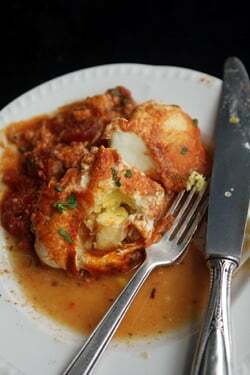 Israeli food writer Nomi Abeliovich, who I had breakfast with at the seaside Manta Ray restaurant, told me that Shakshuka is North African and is considered a seasonal dish, sometimes made with potatoes or spinach instead of spicy tomato sauce. But, like many things about this region, there are diverse opinions and some say it’s from Libya. So if someone’s had the very first, original Shakshuka, please step forward. There’s also a debate and some say it should never have peppers or garlic in it (I’m okay with folks leaving out the peppers), while others top it with strips of halloumi cheese, broiled to a chewy crunch. Which, now that I’ve had, I’m not okay with anyone leaving off. But no matter what country I’ve eaten Shakshuka in, or where it’s from, it always inspires raptures by the people who love it. (And no one seems not to love it.) A few locals offered me tips for making it, including always keeping single portions of the sauce in the freezer, then reheating it on the stove top with an egg cracked in the middle, simmering just until the egg is barely done. 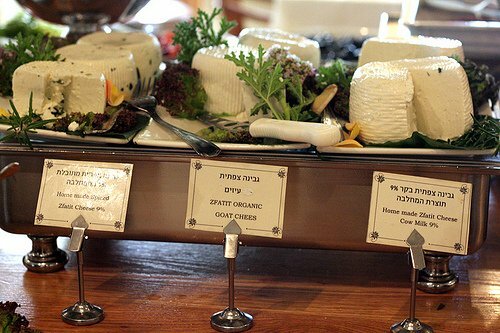 In hot climates like Israel, it’s not uncommon to have salads for breakfast and if you hit a breakfast buffet, there are likely going to be lots of different kinds of “white cheese”, which is vaguely similar to yogurt, but not as tangy, and richer-tasting (similar to fromage blanc, in France) to spoon alongside everything. 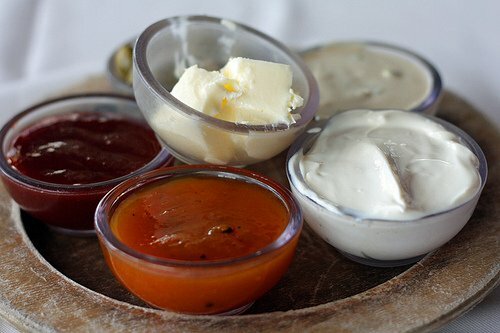 People who wave the flag of “fat is flavor” would be surprised to learn that most of the white cheeses, as well as “cream cheese” type of spreads that I had in Israel, like quark, are very low in fat, yet taste amazing. That’s due to the quality of the milk being so high so instead of loading the products up with fat, letting the sweet, creamy, natural flavor of the milk comes through, loud and clear. So that’s how they can eat all those cheese and still wear those Speedos on the beach. At the Mitzpe Hayamim, a hotel and spa that has fortunately resisted over-modernization, the organic garden provides eighty-percent of the produce used in the kitchen. Not only is the chef and the cooks foraging through the garden for everything from kohlrabi to mulberries, a team of goats, sheep, and cows graze in the pasture, providing the milk for the homemade yogurts and freshly made cheeses that I dug into for breakfast, piling as much as I could onto my plate without drawing undue attention. Foccacia, the Italian bread, which is airy on the inside, and crisp and crunchy on the outside, is popular in Israeli breakfasts, and I had one at the hotel with basil, fresh cheese, and pine nuts for breakfast, which was pretty sensational, along with some of the grainy breads made in their bakery. I’ve been trying to wrangle recipes from everyone and the most elusive has to be the locally made halvah, sweetened sesame paste that I think may be impossible to reproduce at home. 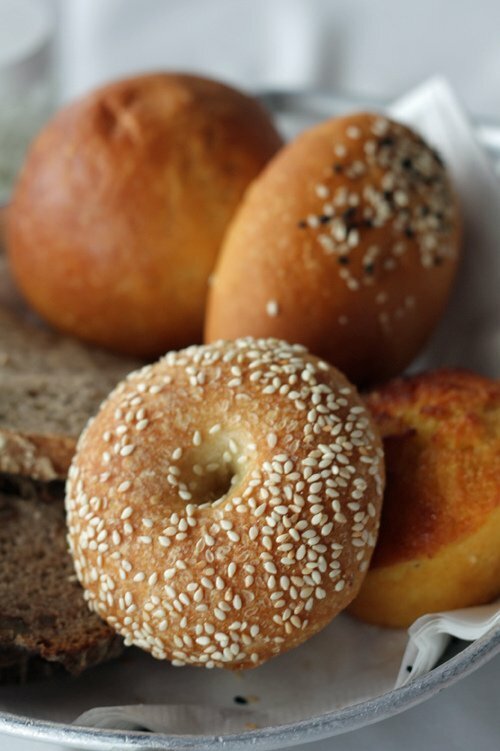 Curiously, what we know as bagels in the United States, aren’t necessarily served for breakfast in Israel. 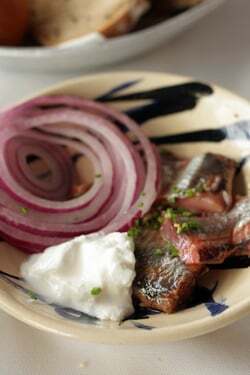 (Which is painful, when you have such great marinated or smoked fish, and creamy-smooth spreading cheeses.) 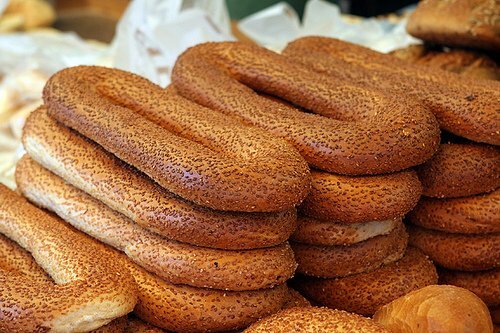 Although sometimes you might come across what elongated, oval “Jerusalem” bagels, which are soft and slightly sweet, but they are more of a snack food than breakfast fare. And they’re huge, too. Each one is as long as a forearm. 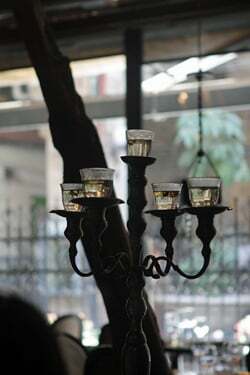 In Jaffa, I had breakfast with a group of Israeli food bloggers at Cordelia, which has a lovely window overlooking a charming street, and was a place where I learned to love butter drenched in olive oil. Breakfast started (perhaps American-style?) 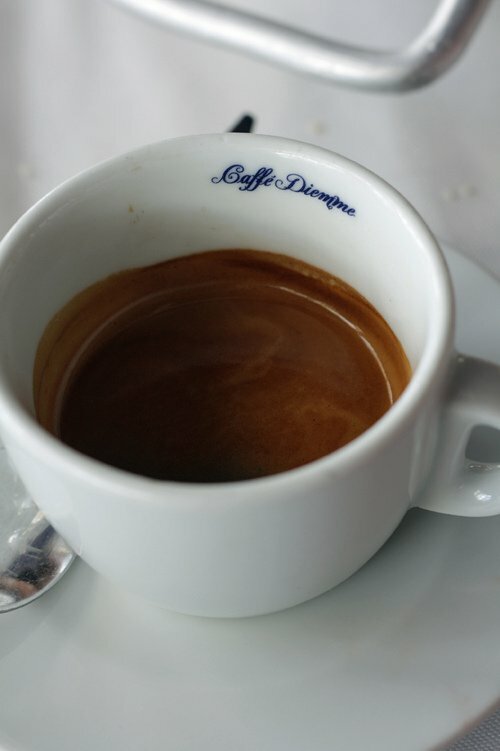 with a cocktail made from red wine, orange, and rosemary, then I quickly moved on to dark coffee, which is taken seriously in Israel, and is pretty much excellent wherever you go. 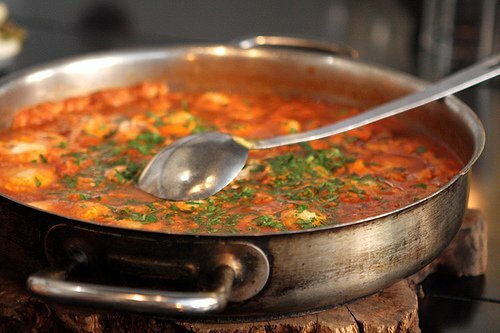 And, of course, a large pan of Shakshuka was brought to the table, to be split – until we could eat no more. It was good I saved a bit of room as a platter piled with challah stuffed with eggs, sautéed in bone marrow was brought out. And since I burned my Speedo, I dug right in. Perhaps my favorite place for a nosh was Lehamin, a bakery that’s apparently busy in the wee-hours of the night, just as it is in the morning. It’s owned by Uri Scheft, a friendly Danish man who studied baking in France and in his native land. 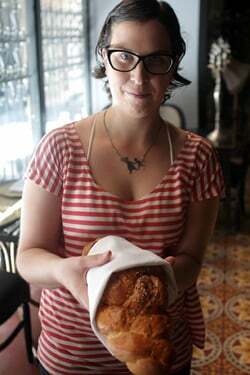 I visited with local blogger Natalie Levin, who is a great baker herself. She arrived bearing sacks of the most delicious tahini cookies imaginable, and another with dark, golden-brown butter cookies made of sahleb, a flour ground from the roots of an orchid plant. 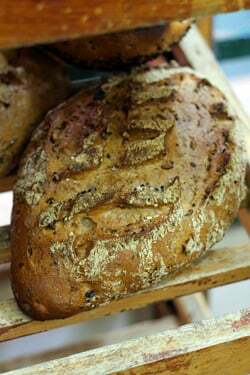 Uri’s Danish roots are apparent in his dense, grainy, breads, the kinds of breads I generally crave. 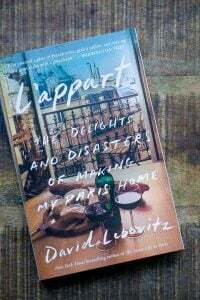 But he also is a big fan of marzipan, which is used as a base for a number of fresh fruit tarts and I saw some oozing out of the warm morning pastries and oozing into a caramelized puddle on a bakers rack. And yes, I resisted the urge to pick it off and eat it. 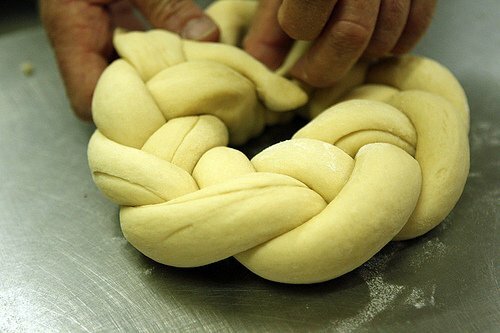 Although she didn’t bring me challah, there was no shortage of those braided loaves in Israel and I was surprised to learn at a relaxed, and friendly shabbat dinner organized by local designers, that challah isn’t meant to be sliced, but pulled apart with your hands. Or with an interesting new contraption, that is certainly a table-stopper when used to pull apart a loaf of the twisted bread. I thought that most rugelach was pretty much alike, pretty dry and tolerable if only because there are a couple of chocolate chips tucked in there, here and there, until I tried the one at Lehamim. My Hebrew is a little rusty (and less-tolerable to the locals, I imagine), which is probably a good thing, because I may have invoked the Lord’s name in vain when I took that first bite. I flipped out over his chocolate rugelach, and carried a container of them around with me for a few days after my visit, because I just could not stand to be without them in my life. 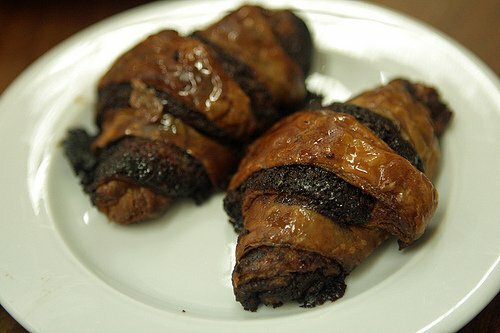 If you think you’ve had chocolate rugelach, think again, as these are moist (not dry), with the rich, dark flavor of bittersweet chocolate. 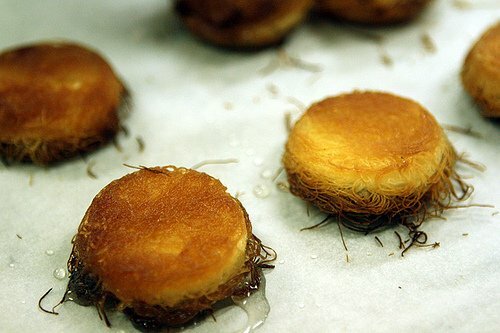 I loved all his pastries, including Kanafeh, made with kadaifi doused in melted butter, pressed into buttered molds, and topped by a disk of fresh goat cheese. It’s then covered completely with more kadaifi, then baked until the pastry is dark brown and the warm cheese is completely enclosed in a buttery, crunchy crust. Now that I’m back home, eating my buttered baguette for breakfast and sipping a café au lait, I am dreaming about sitting by the ocean swilling icy coffee through a straw, and watching in disbelief at servers set down a multitude of dishes, piled high with fresh vegetable salads, pickled fish, and served with just-made carrot juice, which I’m missing tremendously. I do like my French breakfast just fine, although am thinking of how much Shakshuka sauce I can keep on hand. And the rugelach I had to leave behind as well. Note: The meals on this trip were hosted, and part of a culinary exploration organized by Kinetis. My visit to the beach was my own idea. I really enjoyed reading this, thank you so much for sharing! What is that bagel-like bread called in the photo stuffed with some kind of pesto? It’s a particularly great photo. So true–breakfast can be the most challenging part of travel. I would love the Israeli breakfast, because I like to EAT at breakfast! Not sausage-pancakes-style American or (God-forbid) English breakfast, but I like a proper healthy meal. When in Europe I have a hard time when it is just strong coffee and pastry. My best ever was on this year’s trip to Italy, where I enjoyed fresh-squeezed juice and cappuccino, yogurt, an uber-fresh fruit platter, toast with mozzarella and tomatoes, toast with Nutella, AND croissants. David–amazing posts and beautiful photos. I’ve not read a lot about Israeli food but now I want to hop on the next flight to Tel Aviv. The food is gorgeous. If any of the pastries can be made at home, could you post a recipe–ie. chocolate rugelach? Thanks for sharing! I agree with Meredith. I think morning times are the best when kept quiet and serene. I think it’s better for the mind too. And the people who have to get through their mornings with TV or radio blaring – how is that possible? My favorite looking things from this post are the rugelach, definitely, but I’d most like to try the challah and eggs sauteed in bone marrow! Sounds amazing! You lucky dog. Even though it has been several years since my visit to Tel Aviv, my mouth still waters thinking back on Israeli breakfasts and my amazing dinner at Manta Ray. Your post brought back some yummy memories. Thanks! I wish i had known about your visit in Israel in advance. I was a journalist for 12 years and today i am a confisiere and as your fan I wish you would have tasted my candies. Next time! Wow. This post has made me so hungry! Especially the pictures of the eggs in the challah-nest and the one that to me looks like a spinach-stuffed bagel, but I suppose is not since you said they don’t have bagels. Now I want to go to Israel just to eat. Shakshuka is one my favorite foods, along with fresh pita scooping up cold, spicy matbucha. Thank you for taking me to Eretz Yisrael today. Shabbat shalom! Jerusalem bagels = kaakeh, no? 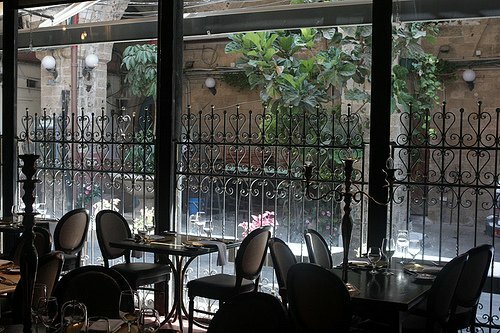 J’ai envie de tout manger, cela m’a l’air absolument délicieux, je n’ai plus qu’à trouver une bonne adresse à Paris. En avez-vous ? I am not a big eater but people must probably drag me away from such a wonderful breakfast buffet. Totally Love! the food from that area and it is high on my “Places I must visit ‘list! Wow, what amazing photographs! The stuffed challah and breads look/sound incredible. The love of food is so universal and discovering new tastes is a definitely benefit of traveling. Thanks for sharing! La recette est complète, pas à pas et s’inscrit dans le cadre de la découverte de la gastronomie israélienne. For people who love food, trying out local food in a new place is a great part of the fun of travel. 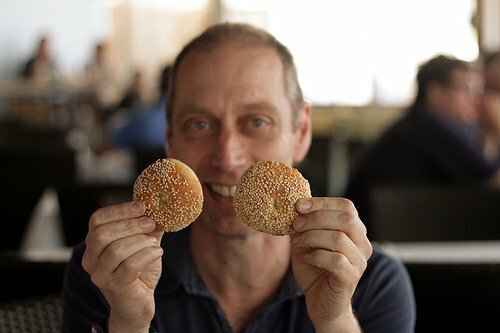 Having never been to Israel, some of the food that you talk about in this post is a revelation to me. I have made rugelach, but the chocolate version that you experienced really looks sensational. And I would certainly love to have the recipe for those tahini cookies! Thanks, once again, for sharing your experiences with us, and the amazing food that is so much a part of that. 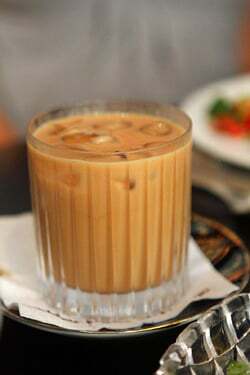 I think it would be great if somebody would analyze various cultures’ breakfast traditions and foods and analyze how climate and the average pace of life affects them. I recommend Eltana Bagel’s shakshuka next time you’re in Seattle. 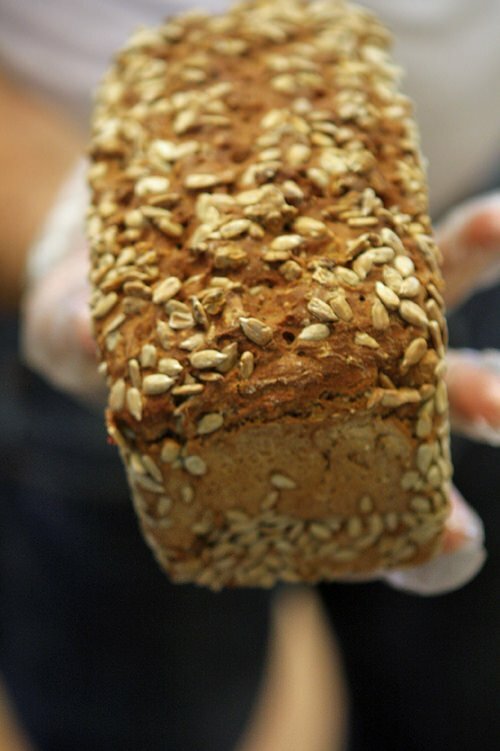 Amazing AND served with a bagel–the perfect breakfast combination! What an amazing breakfast spread! I’m with you, I like to breakfast in solitude (and please, no questions before coffee!). Oh, moan. What a beautiful breakfast spread. 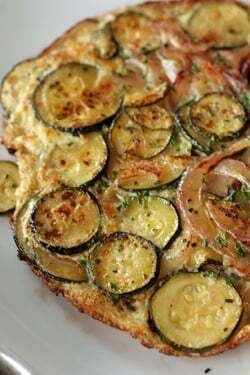 Zucchini fritatta, too, please. Then onto the tahini cookies. I love sesame in all iterations. Yes, breakfast and those hours before noon are meant to be quiet. Not snarly, not boisterous – just quiet. If there is a breakfast Grinch, noise can bring him out in me. 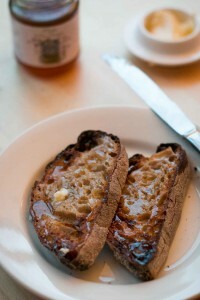 “challah stuffed with eggs, sautéed in bone marrow” oh yes please! Gorgeous photos and great post! If you ever organize your own trip back there, SIGN ME UP! What are the things that look like bagels with green stuff coming out of them? I want to eat that! SmultronSoul and Lydia – the “bagel” looks like spinach bourekas to me, and those are very tasty indeed (though not at all bagel-like). 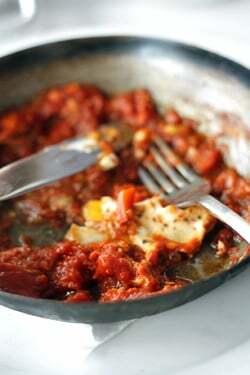 The Shakshuka looks very similar to the Italian/Sicilian “Eggs in Purgatorio” – basically eggs poached in tomato sauce. I’d wager the North African / Israeli version is seasoned somewhat differently. The North African connection is probably the key to the history of the dish- coming north into Sicily and east into Isreal along the mediterranean coast. I guess great ideas travel far. I just love reading your posts about your visit here! So happy to read that you liked Lehamim – I had a feeling this would be a place you’d enjoy and that’s why I was looking forward to taking you there. Again – glad to hear about the Tahini cookies. I had such a wonderful time and I really hope we could meet again in the future for a real baking session together. This could be awesome! Thanks for taking me to the bakery! (And for the cookies!) It was a pretty hectic week and I saw (and ate) so much, that it was hard to keep track of it all. But the bakery was really a highlight of the week – Uri was terrific and I see why he’s such a success. 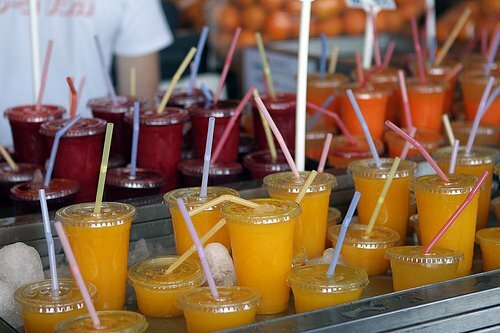 The food in Israel is fantastic, isn´t it? I had the same reaction my first time as an adult in Israel, just a total wonderment at how fresh and delicious and still generally healthy everything was…I guess I was just amazed that people got to have access to that kind of food all the time (and I´m from the Bay Area of all places!) Did you get around to trying the frozen yogurt? It was my absolute favorite. Btw, in the states (at least in my extended family) we never slice challah either! I was really surprised about the food since people don’t discuss the cuisine all that much. But everything was so fresh and the food had so much flavor – the fish, just from the sea, and the vegetables tasted like vegetables, not cardboard. And the cheeses were amazing as well. I didn’t try any frozen yogurt but with the quality of the dairy products, I would imagine it’d be pretty good. Great photos. Thank you for the Israeli breakfast. Most of the information is new to me. Good luck with the blog and serve us more of such tasty posts. Thank you for sharing. Your descriptions with the pictures make me want to visit Israel asap. Oh David…thank you thank you thank you !!!! Those pictures were GORGEOUS !!! I keep thinking that one day some restaurant will serve what I would call a “vegetable breakfast”. I really envy you your trip and thanks for letting us travel vicariously…..
Israeli Breakfast I read, ‘oh, I wonder if he learned how to make halva’, remembering all those seconds trips to the breakfast bar to get ‘just a little’ more. I console myself with the thought that it is probably very calorific and consider myself lucky to have had the opportunity to have eaten it. Still, if anyone has suggestions ….. I was at a place that said their halvah was “house-made” so, of course, I inquired about it. Then they said, “Oh, that’s the one thing here that we don’t make on the premises – someone else makes it for us.” Baker Alice Medrich said that there’s something called soapwart that’s used, but I also think a professional grinder, to get the right texture to the paste, may be vital. 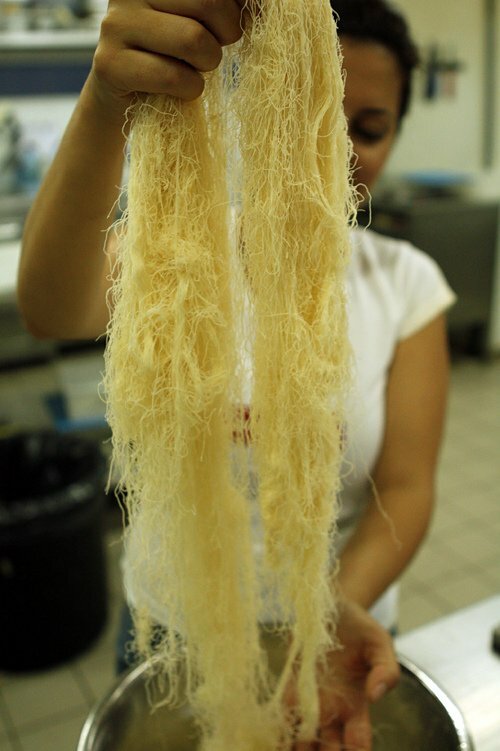 Anissa Helou has a series of pictures of the process. Anyway, the food is soooo familiar with my culture and it looks so delicious. Thank you for sharing. Exceptional post as always! My travel funds I ‘m saving will never be enough! Lol. First, I was saving for Paris, then Switzerland. Now, I have to save for Israel. The food you eat just makes my mouth water and my eyes dance! I love Shakshouka (Shakshuka) for a lazy brunch. I don’t think anyone would NOT love it though seriously. 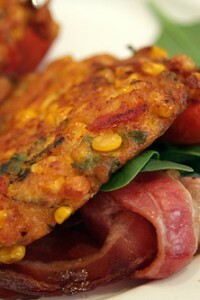 I have not tried the Haloumi version but this has just given me ideas….. I’d make that next! Wowww! Very interesting article! Why can’t we have world peace by sharing our food? David this post is amazing!!! I have never been to Israel nor do I know much about it’s culture. With your help I now know a bit more. This food looks spectacular and I would prefer the lightness of it over traditional US breakfasts. I must go check out that recipe for Shakshuka. It was wonderful watching your journey real time through Instagram! I just had an epiphany reading your to-drool-over-post: it occured to me that shakshuka is very similar to a Czech dish called “leco” (originally Hungarian) that is however usually served for dinner. I’ll eat it anytime. 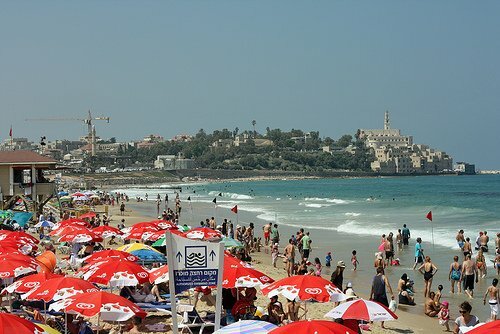 Israel is at the TOP of my bucket list and I am going next summer (cannot wait)! This is such a great post, David, and I loved reading each and every line. You always have such rich and full experiences. I love how you find each and every corner of the cities you visit and how you seek out the experts to take you on your journey! I am saving this post for my upcoming adventure! Thanks so much for sharing this trip to Israel. It looked amazing. Your photos are great. And it has really made me think I need to plan a visit! 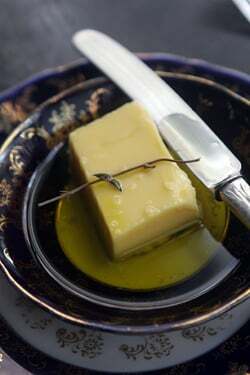 How common is margarine there as opposed to butter? Only when eaten with meat? Everything looks good. It reminds me of why I like Claudia Roden’s cookbooks. I’m in!! Now that’s the kind of breakfast I could eat all day! 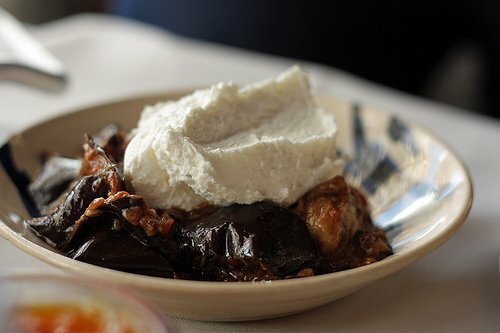 Poached eggs in whatever mushy moist veggie is heaven- salsa, eggplant… Topped with some white cheese? I use Farmer’s cheese here- it’s very light and fresh. The Shakshuka looks stunning — I want to try some even though I am fanatically opposed to undercooked eggs (I know, I know). I think it is the vibrant red of the sauce — you know it tastes good. I have heard nothing but good things about Israeli coffee. I don’t expect to get to Israel, but you never know. I will get to New York again and will watch for Uri’s bakery. David this was an amazing post to read. Your writing and pictures make it all so inviting that it is tempting to get on a plane and go immediately. Thank you for sharing your travel experiences so eloquently. I too am not a morning person but console myself in the knowledge that all those perky morning people are pretty dull later in the day! I can’t take this anymore. What a wonderful trip! Photos are beautiful, the food looks fantastic. Oh, how we Americans need to learn how to . . . eat? No! Dine at any time of day! AMAZING post – al a shakshuka! Thank you for reminding me of everything I love about Israel and Israeli food. 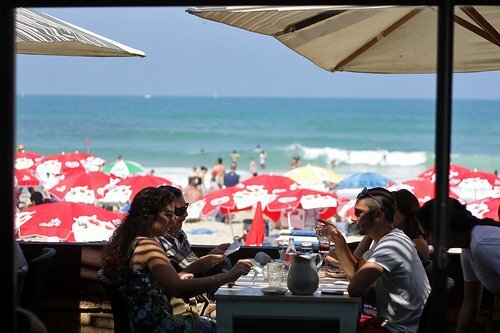 I have loved reading these posts from Israel — the food is amazing — and the beach! Your photos are just beautiful! Very jealous! Must plan a trip soon. You have out done yourself in terms of jawdropping mouthwatering food torture especially ’cause I am currently on a 30day no sugar/no grains fast of sorts. I cannot wait for August to try some of these ideas. Really great post – thank you! I ready for a trip to Israel – yum! If this was already covered somewhere, forgive me for asking again. I live in NYC and am dying to know where Uri is planning on opening a bakery. Thank you. I’m enjoying these posts a lot. I lived in Israel for 20 years, returned to the US 17 years ago. 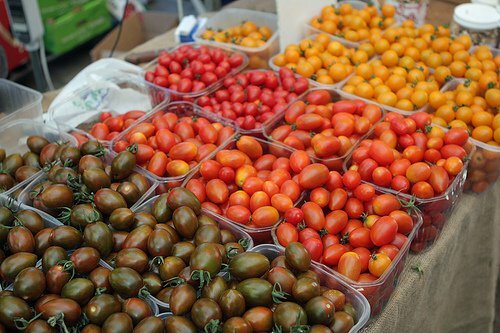 It is amazing to see how much the food movement (for lack of a better word) has blossomed over there. I do notice the changes each time I visit, but you’re sure exposed to more foodie things than I am! 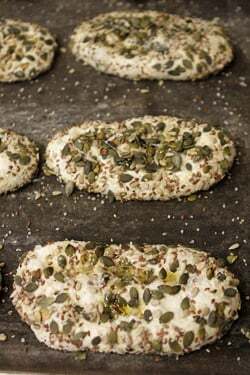 But those oldie-but-goodie Jerusalem bagels can still hold their own — it’s street food, when you buy one from a cart the vendor will usually give you some za’atar that is folded up in a strip of newspaper. 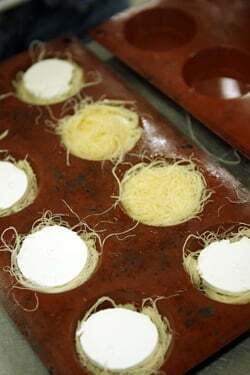 As you walk away you unfold the paper and dip the still-warm bread into the herb. Heaven! Wonderful article David and a refreshing way to start the day here in DC where the temp today may reach 104 F. The beach looks so inviting. And so does the vegetable salad. I’m curious about what you brought back from your trip? You even made me jealous at you for eaten this wonderful food. And I live in Israel, and I’ve been eaten this food all my life and I know how to make most of the things you describe here. P.S., I don’t know how to make Halva. (And why should I? 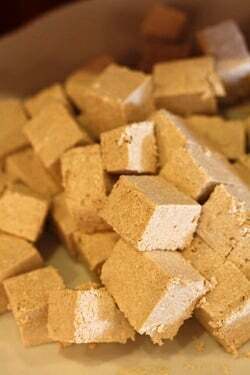 we have wonderful Halva in Mahneh Yehuda Market in Jerusalem. but when I’m away from Israel, and I have to cook dinner(which is usually my job) I makes dessert from Tahini and Silan (honey from dates). I just pour on a dish raw tahini and on top I pour some silan in thin lines. Thanks for reminding me that we have amazing food. It’s curious that people want to make halvah (and tahini) at home, because you really need a professional grinder to get the sesame seeds completely liquified. That said, the bottled tahini I had in Israel was completely different than the regular store-bought stuff I find in the Arabic markets in Paris. It wasn’t bitter at all and was amazing. Thankfully I brought back 3 large jars! 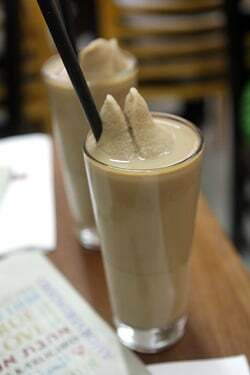 And yes, that halvah place in the Jerusalem market is great. I’ve got some pictures in an upcoming post. David, Wonderful post. I made Shakshuka just the other night before leaving on a 2 month trip Co, Pa, Germany. It is a perfect cean out the frig treat. I too am not a morning person, but when traveling I find I get into the rythm of wherever I am. Shakshuka is one of my family’s favorite dinner meals. 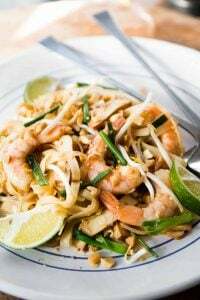 Ottolonghi’s recipe is the best and this is one of the most popular dishes I teach kids to cook. The kids and parents can’t believe how easy and delicious it is. Quark! I forgot all about since I left Oregon, where a local guy produced it. Never knew it had Israeli or Middle Eastern origins – I just thought it was something some hippies came up with. All the same, very delicious, you’d never know it was fat free. What a great post and how fascinating this trip must have been for you and the other bloggers. I’ve read through the other blogger posts and although there are similarities theyre all different perspectives. Very interesting. I’d love the cookie recipe that you tried. Any chance she will share that with you? Holy cow that was one amazing post! And thank you because I imagine that it took quite a bit of time to put together. Wow. Wow. Wow. If my honey wasn’t cooking tonight and if we hadn’t already had eggs and peppers for lunch, I would be attempting that Shakshuka NOW. Un grand merci!!! I’m my best towards the evening. Breakfast is mostly a necessary evil. Had a great breakfast in Turkey once that would qualify among my top-5. I just returned on the 4th from a 2 week study trip in Israel with a group of 37. Stayed at the Dead Sea, The Galilee (a kibbutz), Netanya and Jerusalem. Enough of your pictures bring back pleasant memories, but some make me realize we may have missed some of the best food Israel has to offer. OMG! The food looks and sounds exquisite. Israel just got bumped up to #1 on my ‘Places to Go’ list. Thanks for sharing David. This must be one of your best blogs! As lots of others say, this had me drooling… words and text and food so appetising… how do you photograph the food and the light so well, with the textures and the sun so brilliant? Wow!!!! Everything sounds so good and your photos are fantastic. 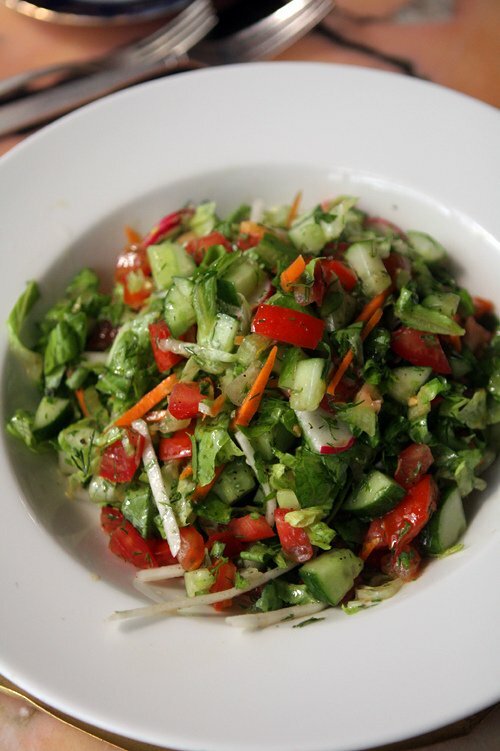 The Israeli salad looks like the perfect summer salad…any time of the day or evening. Would you happen to have a recipe to share for this…or any of the other dishes you’ve shown. They all look amazing. There is a recipe for Israeli Salad in the previous post, that’s delicious. I recommend The Book of New Israeli Food, by Janna Gur, which has recipes for many of the other dishes traditionally served at Israeli breakfasts. 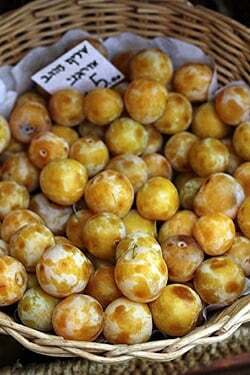 Fantastic peek into Israeli food. my mouth is watering and thank you for reminding me how exquisite Israeli food and breakfast can be. Did you make it to Max Brenner while you were there? That’s a chocoholic’s paradise. I went to Ika Chocolate (several times!) because her chocolates are quite special, and excellent. I even brought some back for my friends in Paris … who loved them, too! My favorite breakfast of the summer: Good artisan bread drizzled with olive oil and toasted, topped with a layer of your oven roasted tomatoes and a fried egg. We were there in April and if anything spoiled us rotten it was breakfast! American breakfast doesn’t hold a candle to breakfast in Israel and that’s saying something, seeing as there wasn’t a bit of bacony goodness anywhere in sight! The bread tables, the fruit, the cheese plates, the grapefruit juice changed my life a little and the shakshuka, well, you did that delight due justice! It was a remarkable trip, made especially so by the wonders of the Israeli kitchen!! Absolutely one of your best posts ever, the food, the story, the photos and above all, the place. Ditto the one on Israeli salad. Re: breakfast and solitude, when I read the following I guffawed. What a lovely post. Thank you for sharing! I am very much looking forward to reading (and seeing) more. The reason that challah is supposed to be torn rather than cut is that an observant Jew is not supposed to use tools (and that includes knives) during the Sabbath. This is only applicable during the Sabbath; there is no problem with cutting during the rest of the week- everyone knows that leftover challah is GREAT for french toast on a Sunday morning. I’ve lived in Israel for close on 17 years now and I love shakshuka in all its variations. 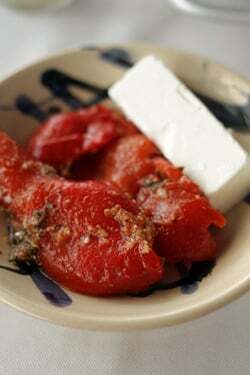 Have had with feta cheese before, but not halloumi – must try that next. There’s also ‘green shakshuka’ where the sauce is made with spinach and bechamel, or with chard and mushrooms and cream – that’s great as a change, although I still prefer a good spicy tomato sauce as the base most of the time. I’d like to add my vote for the origins of the dish being Libyan – I grew up in England but my father is from Libya, and he made shakshuka at home the whole time when I was growing up. I’m married to an American and we occasionally go to the States for Passover, where my husband’s mother runs a Passover program at a very good hotel. The food is generally excellent, but after 17 years in Israel, I still can’t get to grips with the fact that there is no salad available at breakfast time – it just seems wrong! I have loved this series on Israel, seriously wonderful food. 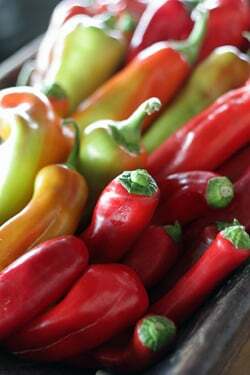 Off to see Michael Pollan talk tonite at Melbourne Town Hall, so more good food info! As if I needed more of a reason to get myself to Israel ASAP – I want a little bit of everything you’ve covered here! Operation Israel 2013 is in full swing. Now, to convince the hubs. I just tweeted this, it all looks so delicious! I will definitely make a point to check out Lehamim. I’ve heard from other places its the best as well. You can find black beans sometimes in stores that specialize in Middle Eastern products, such as those in Belleville, or along the rue du Faubourg St Denis. Or Sabah, at the Marche d’Aligré. Unfortunately they’re not an item with a high turnover, so they have often been on the shelf for a while and consequently, they don’t soften well when cooked, I’ve found. I usually bring them back from the states, for that reason. What an incredible trip!! You described everything so beautifully I was able to relive my own trips to Israel vicariously. Thanks again David. On another topic, my daughter recently bought me an ice cream maker and I quickly ordered the Perfect Scoop to accompany it. To date I have made the strawberry frozen yogurt and the grapefruit champagne sorbet. Awesome!! Right now I have the mix for apricot sorbet chilling in the fridge. A million thanks. This is probably one of my most favorite posts, so far. I knew nothing about Israeli food and now I want to visit. Everything sounds right up my alley. 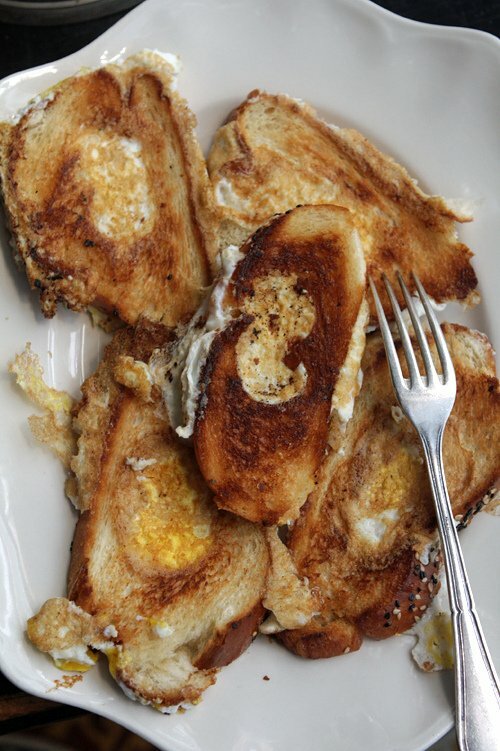 That challah with the egg looked like old fashioned egg in a hole to me — must be fab in the Israeli bread. I absolutely love your blog!!!! I have been wanting to leave a comment to many of your posts, but haven’t. Oops- anyways, this time because of shakshuka, I just had to. I am an Algerian living in Washington DC…you know where I am going with this…if not then let me tell you. Shakshuka is the Summer staple dish in Algeria. 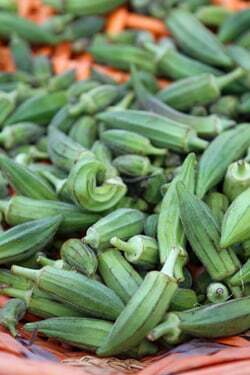 Growing up, we used to have it almost every other day as an accompaniment to French fries, merguez and fried zucchini- we would also have it with fried or scrambled eggs… It is usually eaten with a baguette or Algerian homemade bread (matlou3) YUM YUM YUM!!! 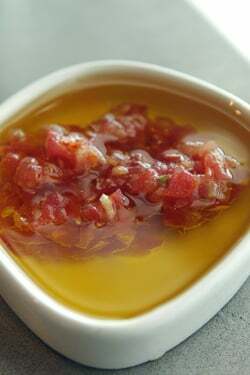 I especially like it with delicious Tunisian Harissa and a drizzle of olive oil! While I am not sure of its origins, I would only guess that it came to Algeria with the many Spanish (Sephardi) Jews who fled away from the Spanish persecution of the 14th century. In the 15th century, more Jews were expulsed from Spain and Portugal. They found refuge in the Ottoman Empire, which North Africa was part. To make a long and sad story short, I believe that the richness of the North African cuisines comes from the rich cultures that have melded together and given us delectable dishes and pastries. I did a little digging and there are a number of countries that get credit for Shakshuka (heck, it’s so good – I’d like to take credit, too!) It’s always hard to know where things came from & food anthropologists research for years trying to figure out the origins of things. Foods like French fries (Belgium), and Croissants (Austria) often get attributed to France, there’s pasta (from China), – hamburgers (a mashup, with a nod of credit going to the Earl of Sandwich, of England?…as well as Germans, who made ‘Hamburg steaks’) and hot dogs (Germany) get attributed to America. And I remember the first time I went to Mexico, expecting to find Burritos everywhere, only to be told that they were “Californian”. They are Mexican, but the overstuffed ones that we know are considered “American burritos”. Kind of like those overstuffed omlettes, which are based on the French classic, but I suppose if you overfill anything, you can call is “American” ! Thank you, as always, Sir Lebovitz, for sharing your stories and your photos! 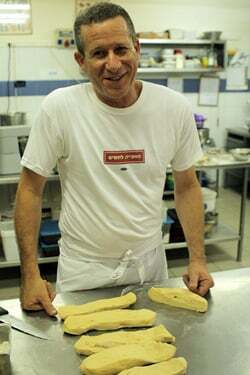 Do u happen to know what Uri will be naming his bakery when it opens in the fall in NYC? I would love to go there when it opens. I made Shakshuka from your attached recipe and it was amazing! Thank you! And double thank you for your wonderful posts. I read them religiously. Rugalach is the best treat ever. I love them, I love eating them with a cafe afuch in the morning. Love your posts David….always a delight to read. 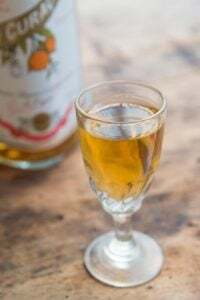 I have been sleuthing for some information on the Peche De Vigne which I discovered at the Raspail Organic markets in late September of 2009. In doing so I came across a post of yours from 2005. I understood someone to tell me that these peaches act as “markers” for mildew on organic vines in vineyards in the south of France. 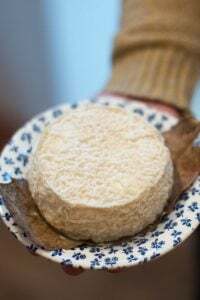 Because mould will appear on the furry peach skins before it will on the smooth grape skins it possibly indicates that copper may have to be introduced to keep the undesirable mould at bay. Can you verify this or is it simply a fanciful interpretation by me? Never the less they smelt and tasted absolutely fabulous, in fact I smelt them before I saw them! Here’s hoping you can shed some light. Challah has always been my favourite food, and now always reminds me of when I was a little one and would practically only eat challah! 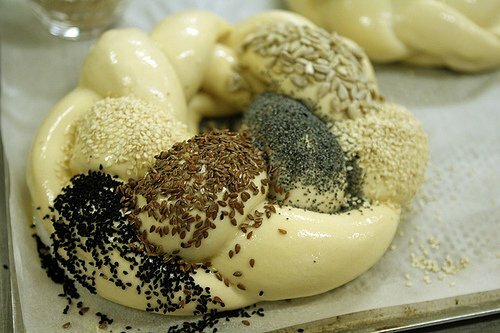 I think Jewish breads are probably my favourites, they always are so delicious! The round “bagels” which many of the commentators asked about (picture 25 from the top) are spinach and cheese filled borekas (pronounced as boorekas) the plural of “BOREK”, A Turkish / balcanic pastry made of fillo leaves or puff pastries filled with boiled spinach and salted cheese. 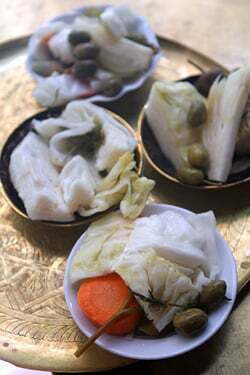 A triangular borek will always contain cheese and will be treated as a dairy product which will prohibit the religious person who ate it from eating meat & chicken for 3 hours. A Rectangle borek – will always contain mash potatoes (no butter) and is considered parve (not dairy nor meat) and can be eaten at any time. A round borek – will contain all the rest of the fillings which may include (spinach & cheese, eggplants mash, spicy tuna & tomatoes, minced meat (very rare) or pizza (tomato paste & chopped olives). Borekas were originally a Shabbat food eaten by the Sephardic Jews on their return from the Morning Prayer at the synagogue but in modern Israeli it well spread (I wonder why :) ) and now served all week long at all hours. These pastries are at best coming right out of the oven (most pastries are) at the very early morning and considered a wonderful alcohol observant. Living through your travels always makes me hungry. And I just had lunch. A very good lunch mind you with gazpacho and goat cheese. 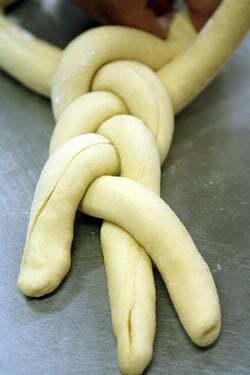 But now the only thing on my mind is braided bread. NO most observant jews do cut their challah on the Sabbath, and use knives, which is most certainly not prohibited. A quick look in any judaica store will find many different decorated knives just for cutting the challah. 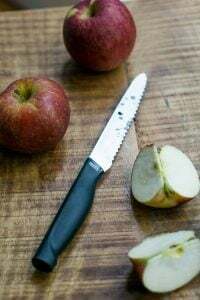 Even if they do rip the challah it has nothing to do with a prohibition against cutting or tools, there most certainly will be knives on the table just like everyone else! Dave first of all thanks for the wonderful pictures and stories! The “soapwort” is an extract from a plant root which is needed in small quantities to create the special texture of Halva. Making the halva is a combination of the grinding of the sesame seeds but more importantly how it is mixed. Hi David, I am from Israel and live at San Francisco Bay Area. My family and I are missing Israel very much. When I cook Israeli food, it helps us to feel closer to the home. 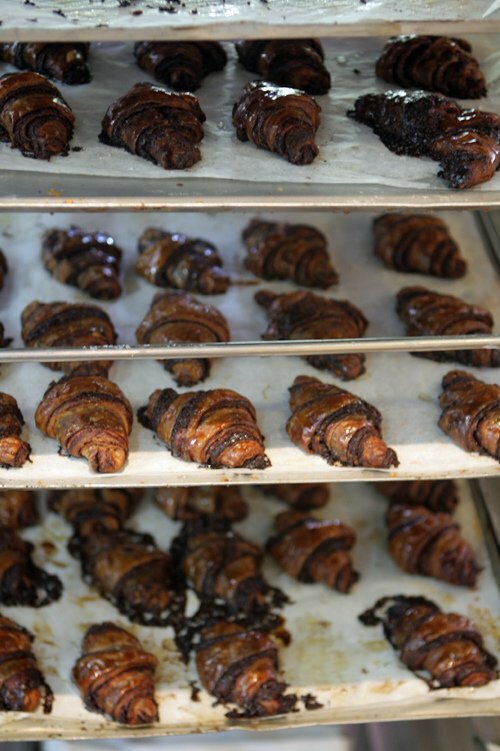 Do you have a recipe for the rugelach? Please share if you do. I would be so happy to recreate the taste at home. wow that looks great. do you know where to get shakshuka in nyc? i’d heard of it before and it resembles a dish my italian grandmother made. must be something in the mediterranean. I’ve been wanting to try shakshuka for years, perhaps now I’ll get off my fat @$$ and make my own! David, you’ve done what relatives in my and my husband’s family have been unable to do: make me want to go to Israel. ooo such beautiful food! and nice to know how those israelis stay so thin…! I am a big fan, you are doing a great job. Ever since I got back from a trip in Turkey, I’m completely in love with this sweet sesame-y flavour of the flaky goodness… I like halva on its own, but it’s absolutely mind-blowing just shredded in some yoghurt, it’s more refreshing and thus perfect for a refreshing summer breakfast – throw in some oats, dried fruit and you’re laughing. 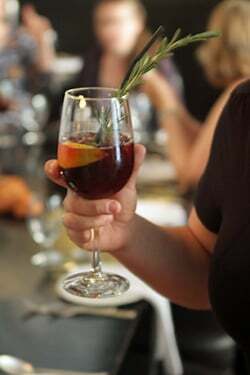 Can you share the recipe for the red wine and rosemary cocktail?? I have been following your wonderful recipes for a few months. I am currently living in Cancun, Mexico and it’s such a pleasure to try out your recipes. My family certainly appreciates them, as your cooking is in the league of it’s own. Our family has been reading your blog for a while now leading up to our trip to France. Coincidentally, as an extension of our trip to France, we decided to go to Israel, too. Right when you where there! :) We had the exact same challah from Lchaim, and enjoyed our fair share of shakshuka and salads, too!! Thank you. This I will be forwarding to my beloved-but-far-too-chatty-in-the-mornings boyfriend as evidence that other people like me exist! These few Israel posts are making me both nostalgic for the food and there and excited for a trip I have planned in a few months. The next time you’re in Israel, if you haven’t already hit up the Jerusalem bakeries they are also divine, and there is one called Marzipan (I presume it’s spelled מרזיפן)–they make what I would argue are the absolute best rugelach, and their challah is totally non-traditional but life-changing nonetheless. Stunning photos. I’m starving after reading this post! I agree…absolutely cannot leave out the halloumi! I love shakshuka!! I feel like it is one of those breakfast items that you do not see often enough on menus. Interestingly, I have never seen it made with spinach or potatoes. I just had a fabulous shakshuka feast at the Israeli restaurant, Neni in Vienna’s Naschmarkt. There were peppers inside, no haloumi on top with lots of spices! However after reading your post, I am thinking a shakshuka tour of Israel should be planned! Marvelous! And bittersweet, as I’ve yet to locate any of these delicious-looking things in Idaho. Hi, David. This post was such a treat. Breakfast is my favorite meal of the day no matter where I am, but breakfast in Israel is breakfast in all its glory! Some of my best memories of living there are from around the breakfast table, for sure. Last week on my own blog, I wrote about a honeyed tahini that I tasted for the first time in Israel. Is that what I see in the photo of small bowls holding jams and butter, behind the white cheese? I posted a recipe for the stuff here (if you can even call it a recipe; combine tahini, honey, and cinnamon, and stir). 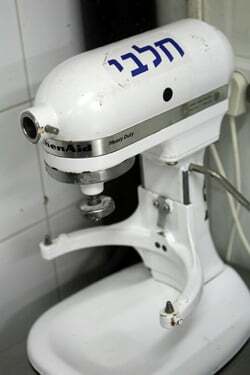 I eat it on everything – toast, salted rice cakes, apples – and this weekend I’m going to see what happens when it meets milk and cream in my ice cream maker! I can’t wait. For posting the recipe for the Israeli Salad. 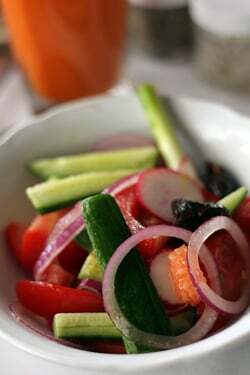 It is a most delicious salad for anytime and is very healthy. I have already made it a couple of times and shared with my friends. Everyone loves the salad and I am hooked, in fact crave this salad. OH MY why are you so cruel. This is not even humane, showing us all these incredible, out of reach foods. My goodness. Excuse me while I drown my sorrows in a gallon of Pure Maple Syrup. I just started a low (ish) carb diet and really at the wrong time happened upon this blog post. I have made my own shakshuka, and even hunted down the halloumi cheese and it was wonderful. 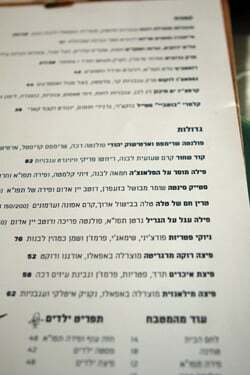 Even though I’ve never been to Israel, I feel like I can go there and know what to order. Great post thank you!! 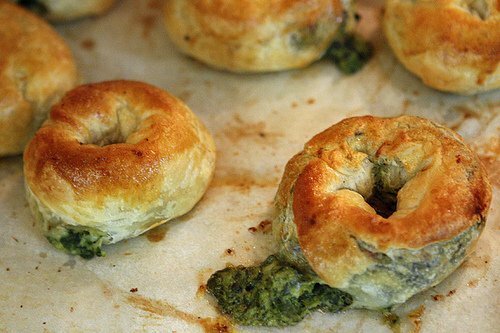 oh my goodness, what is that bagel look a like with what appears to be spinach/cheese oozing out? im going to be dreaming about that tonight!! would love to know what it is!! great post- read all your Israel posts so far, very interesting!! Shashukas are so nice in the summer when tomatoes are plentiful… I made one the other day from Bon Appetit with chickpeas and feta with home roasted tomatoes. The first one I had was when I accidentally landed in an Israeli Hostel in Mexico. They made a large pot of it for dinner and shared it with everyone. 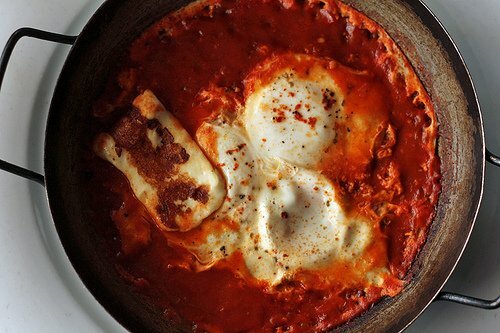 I do shashuka all the time – just didn’t know it’s called this way :) Eggs for breakfast – is my weekend staple. This post has to be prohibited, too much good stuff in here…thanks though! Such a tempting pictures, best foods ever.